The electric car revolution has become a hot investing theme in recent years as many believe it will transform the future of transport. However, there are still several barriers to the widespread adoption of electric vehicles (EVs), according to a new report by financial group Citi called “Electric Vehicles: Ready(ing) for adoption”, which was released on June 11. The world is in the early stages of adoption, with battery electric vehicles (BEV) making up less than 1% of new car sales globally. The financial group’s base case scenario is for a penetration rate of 10% by 2030 while its bull case scenario is a penetration rate of 18%. The main barriers to adoption are the relatively high cost of EVs, limited travel range and lack of charging infrastructure. Currently, what is driving EV development are the “push” factors on the supply side. This includes government support through taxes and incentives as well as regulations on emissions that make EVs cheaper than cars with internal combustion engines (ICE). These factors are also pushing carmakers to invest in R&D for EVs, particularly in the top three EV markets — China, Europe and the US. The Chinese government is targeting to have two million New Energy Vehicle (NEV) units by 2020 from 580,000 last year. Meanwhile, the authors of the report estimate that 1.3 million units will need to be sold in Europe in 2020 to comply with emissions targets, compared with the 270,000 sold last year. EV penetration in the US is estimated to grow the slowest as its fuel-efficiency regulations set by the previous administration are under review and are likely to be relaxed. The supportive policies are one of the reasons Europe and China are expected to become the largest EV markets in the world. China will continue to be the key driver of the BEV market in the near to medium term, but Europe is not expected to catch up until 2030. Europe and China are expected to remain the largest EV markets, with a compound annual growth rate of 27% and 21% respectively between 2017 and 2030. BAIC Group — China’s biggest electric car maker — sold the most EVs in the world last year, at about 100,000 units. The company is a state-owned enterprise and its EV arm is reportedly listed on the Shanghai stock exchange under its affiliate, Beijing Qian Feng Electronics Co.
By 2020 and 2025, however, Volkswagen (VW) and SAIC Motor Corp Ltd are expected to lead in terms of absolute BEV volumes sold globally. SAIC Motor is the largest auto company on China’s A-share market. Excluding pure-play EV manufacturers such as Tesla, BAIC and Anhui Jianghuai Automobile Group Corp Ltd are expected to have the highest EV penetration in 2025. Anhui Jianghuai is listed on the Shanghai stock exchange. Other carmakers that will be pushing out EV models in the next few years include BMW, Porsche, Skoda and Daimler in Europe, Geely Group in China, Honda and Toyota in Japan, Hyundai in South Korea and Tesla, Ford and General Motors in the US. Hybrid EVs (HEVs); plug-in HEVs (PHEVs); electric range extended vehicles (E-REVs), which come with ICEs that are supplemented with electric batteries; and BEVs. HEVs are charged by energy recuperation while PHEVs and BEVs are charged with electricity. Despite the growing BEV sales, the authors of the report still expect more than 90% of new cars sold in 2030 to come with an ICE. But gradually, the new cars sold will likely also have a level of electrification, such as a PHEV or HEV. Meanwhile, in the next three years, consumers will see a significantly expanded EV product range. The number of new BEV and PHEV models launched globally doubled last year and is expected to double again this year. The main barriers to adoption of BEVs are vehicle range, infrastructure, battery degradation and cost. Range anxiety, as the report suggests, is born from consumers’ desire to drive long distances without having to refuel. BEVs currently take longer to recharge than it takes to refuel a traditional vehicle. The average refuelling time for ICE cars is four minutes while BEVs take 7 hours and 20 minutes to recharge. However, as battery costs come down, vehicle range is expected to improve. For instance, Nissan Leaf, Ford Focus BEV, VW e-Golf and Chevrolet Bolt have managed to improve the range by increasing battery capacity. The lack of charging infrastructure compared to the well-established network of gas pumps is another issue. China currently has the largest charging infrastructure in absolute terms, but the European nations have the best charging infrastructure per capita, the report points out. The Netherlands and Norway lead in the number of publicly available charging points per million population. On the other hand, battery degradation continues to weigh on consumer confidence, despite some of Tesla’s models showing encouraging results. The cost of batteries is also the largest hurdle for mass production of EVs, according to an expert interviewed in the report. The cost spills over to the price of BEVs, which is what the report suggests as the biggest barrier to BEV adoption. When the prices of the most popular BEVs in the UK are compared with their ICE alternatives, the list price of an ICE alternative is found to be 33% below its BEV equivalent. The comparison does not take into account models on the premium end of the market such as Tesla Model X and Audi Q7. purchases are via finance plans such as loans. According to the authors’ calculation, the funding gap between a BEV and ICE is an average of 26% of the BEV’s list price, so purchasing an ICE saves 39% of the vehicle’s list price. The trade-off is the cost of fuel. If three years of fuel costs are taken into consideration, ICE is still 5% cheaper than a BEV over a three-year period. The prices of BEVs are expected to decline as battery costs fall. Going forward, the authors of the report expect solid-state batteries to be the next-generation battery technology that can resolve a lot of the current problems. Compared with batteries with liquid electrolyte, solid-state cells can store double the energy despite being 75% smaller. Several companies are making headway in the solid-state battery space, including Dyson, VW, Hyundai, BMW and Audi. This trend, however, could be interrupted by innovations in lithium-ion batteries. Electric buses and commercial vehicles (e-CV) are another market expected to grow in the coming years. 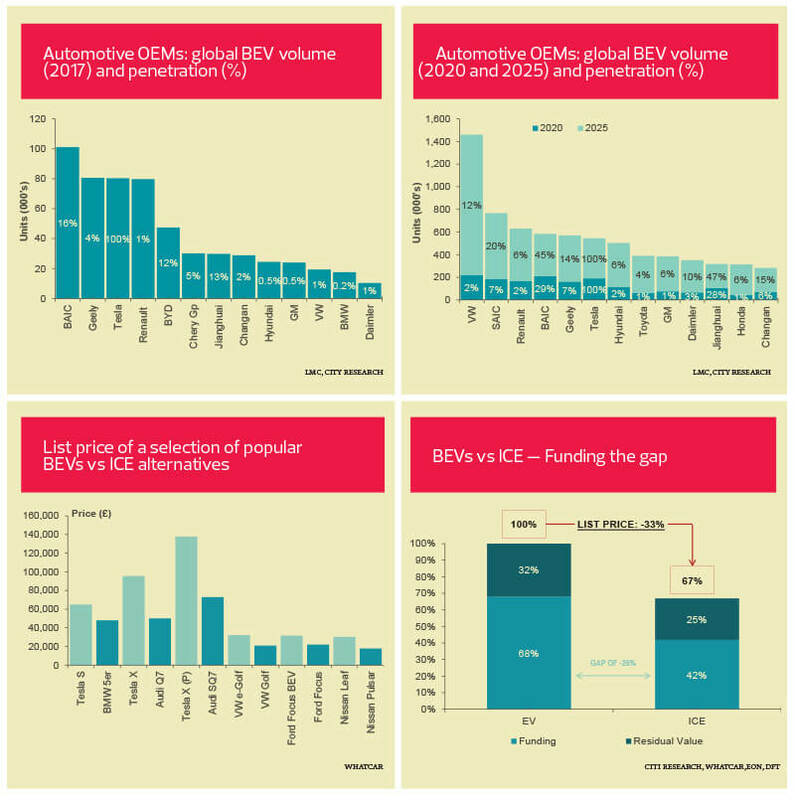 The European e-CV market is forecast to grow by 56% per year. In the US, the e-CV market is estimated to grow at a CAGR of 30%. The e-bus segment is still in the early stages of development, but the market in China is already well established due to generous subsidies. This trend has driven the lithium-ion battery demand since 2014.